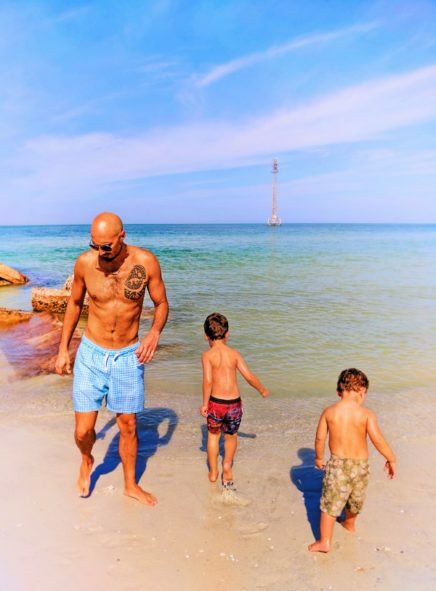 We’ve shared all kinds of non-beach things to do in Florida because we just love how different Florida’s nature is from that of our local Pacific Northwest, but we certainly love the beaches too. 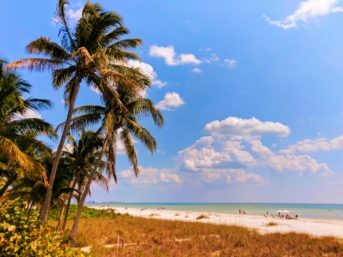 From the edge of the Everglades to the start of the Panhandle, the Florida Gulf Coast beaches are beautiful and each is very different. 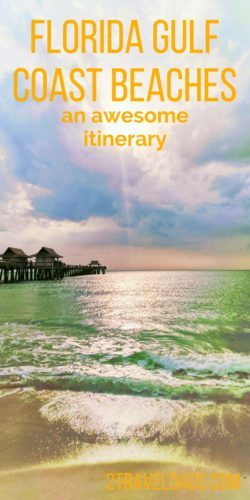 Take a look at our ideas of how to have an awesome beach road trip vacation on Florida’s west coast. 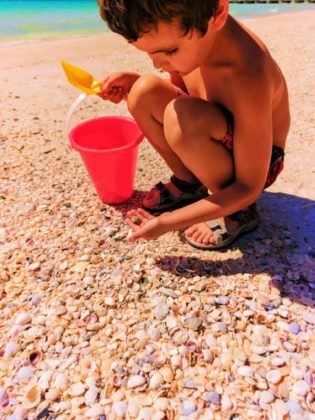 The towns are fun, the beaches beautiful and the shells abundant. So here we go, starting in the south and ending many beaches to the north. Enjoy! 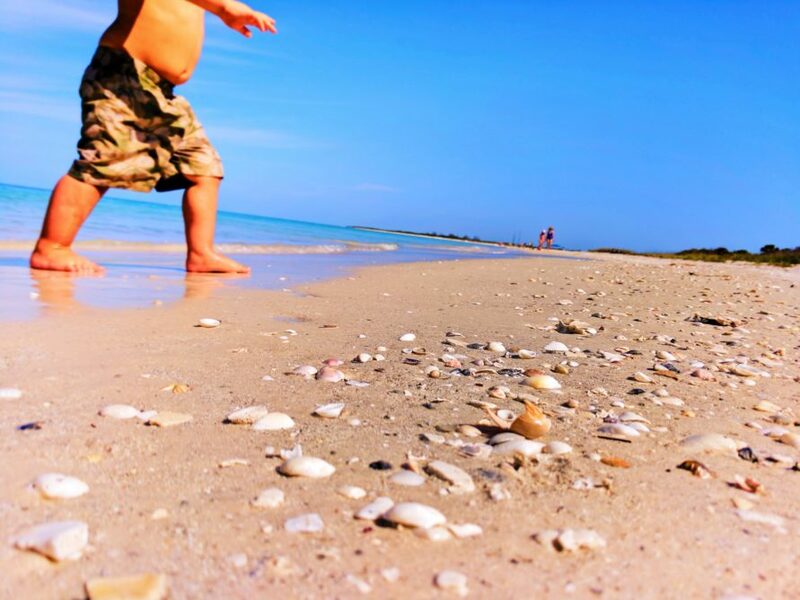 There are a few options for planning a trip around the Florida Gulf Coast beaches. 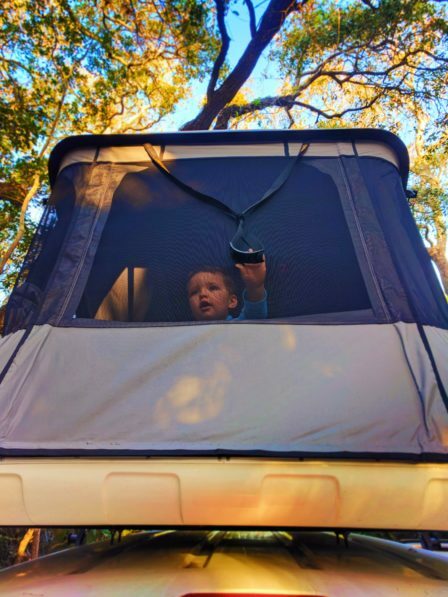 Camping, hotels and vacation rentals are all over the place and hit totally different price points. Here’s the scoop. 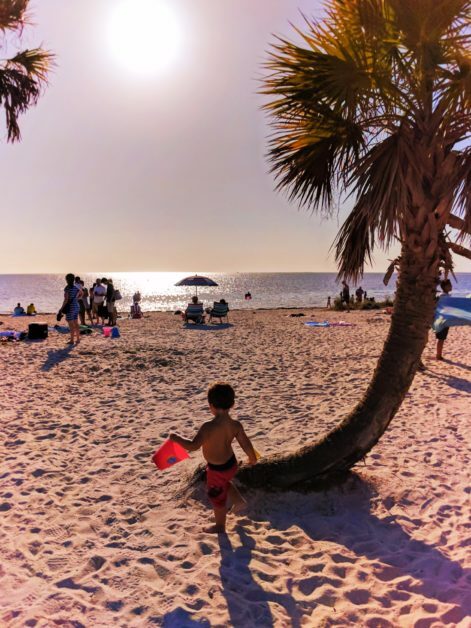 We went this route for our big Florida Gulf Coast road trip. 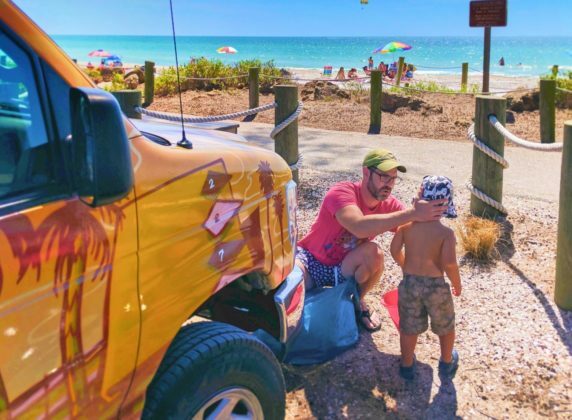 We actually rented an Escape Campervan out of Miami Beach and then headed west. 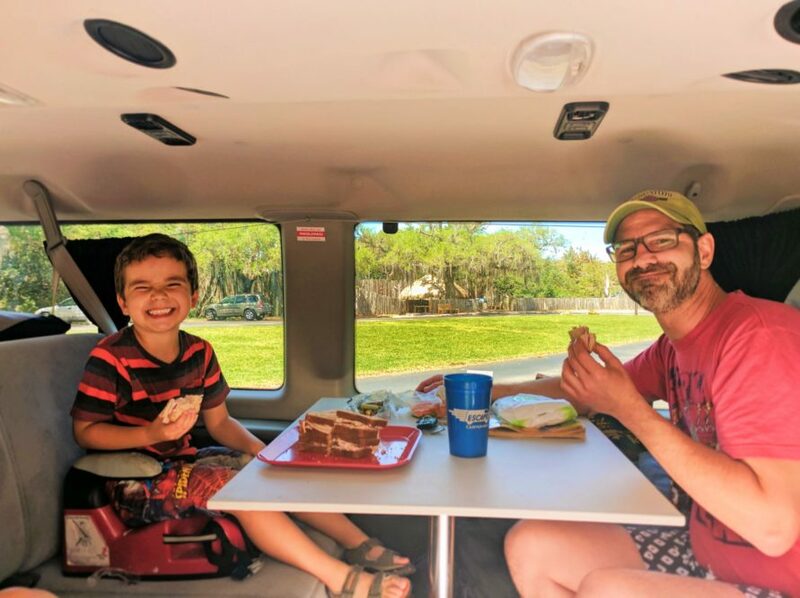 Having a campervan afforded us flexibility for where we could camp, cooking and picnicking on the go, and extra room in the budget for fun activities. We didn’t have to rent a car since we had the campervan and we didn’t have the burden of toting luggage everywhere. Cost of camping: sites range from $17-$50/day; vehicles range from $40-$120/day; campervan ranges from $60-$130/day. 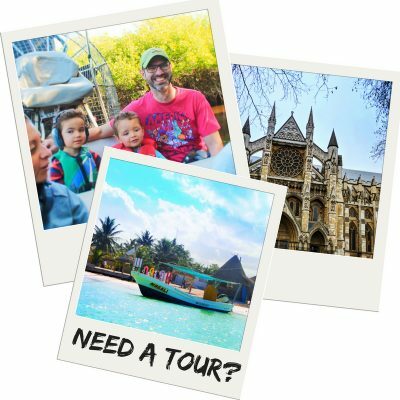 Tip: if you want to do an Escape Campervan, check their site for specials, including relocation deals. Same goes with Cruise America or other rental companies. 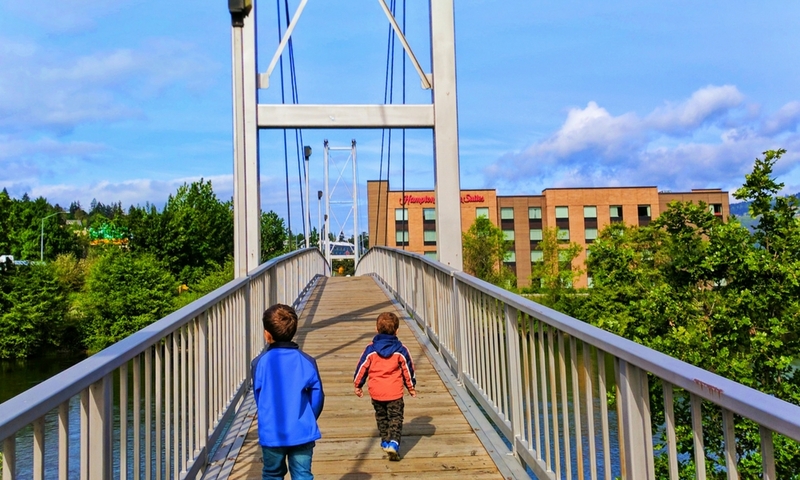 We are big supporters of vacation rentals and they’re a great way to immerse in the town experience. 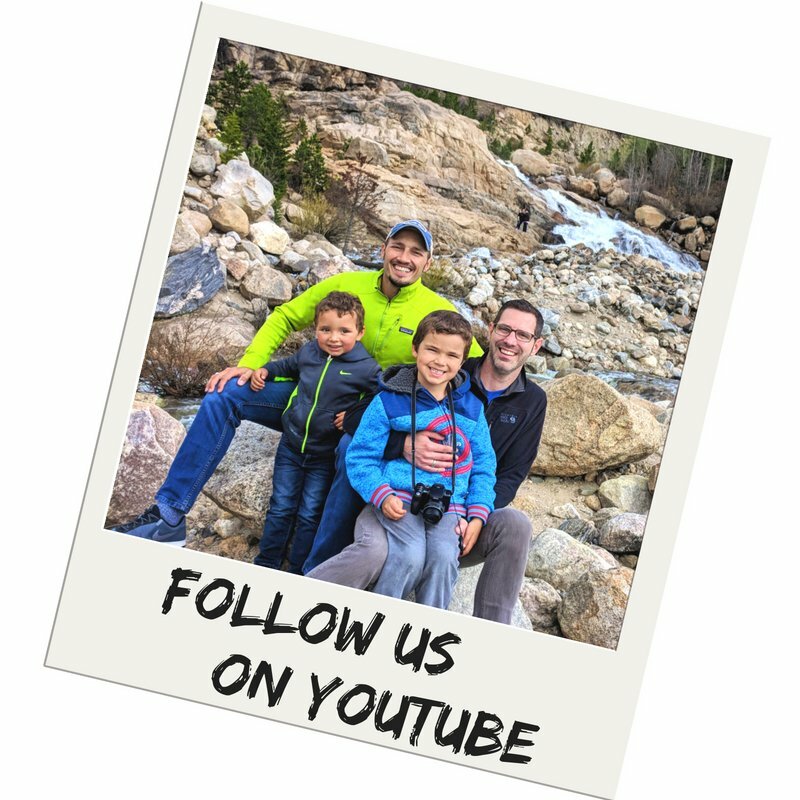 We enjoyed a great VRBO rental up in the Olympic Mountains for our annual family reunion; we’ve leveraged AirBNB and Mister BNB for city breaks; and most recently had a great vacation condo on the beach in St Augustine. Vacation rentals are great because you feel like you’re at home each day. Also, you can usually get a good deal for a longer stay. Cost of a Vacation Rental: from an average of $70/day to averaging $300/day, vacation rentails will vary greatly depending on dates, rental quality, demand, and length of stay. Note: VRBO/HomeAway properties are all just for the renter. AirBNB/Mister BNB are shared space rentals, so you’ll probably be interacting with the hosts/owners. What’s your preference? This is where you’ll be seeing that daily cost jump up. Florida Gulf Coast beaches are beautiful and the hotels, and even motels, close to the beach are quite nice. If you’re planning on doing hotels on your trip, consider staying away from the beach or perhaps across the street. The daily rate will be much less and the distance from the beach might make for seeing more of the area than just the one block buffer of the beach towns. Tip: booking a hotel just over a month out will get you the best rate, particularly if you’re booking midweek. The closer you get to your dates and then on Friday/Saturday nights, beach hotels cost much more and you’ll be rethinking your spend. 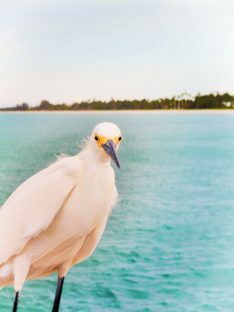 Just north of Everglades National Park is the City of Naples, Florida. It’s our first big stop on our Florida Gulf Coast beaches trip. Naples is a sprawling city, but the beach area about the old town core is really cute and perfect to start your beach time. The neighborhoods are quaint and well maintained and the shopping areas are just trendy enough to make you not feel like a tourist. 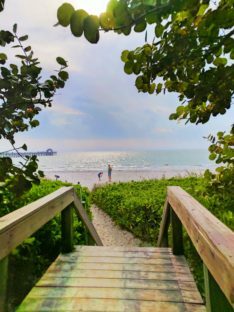 Naples Beach and Pier are very easily accessible. With a really efficient street parking system (text message notifications even! ), you don’t need to worry about getting towed and you’ll be able to find parking close to the beach access spots. The beaches are very well maintained and private property is clearly marked. The Pier at Naples is great for people/dolphin watching. 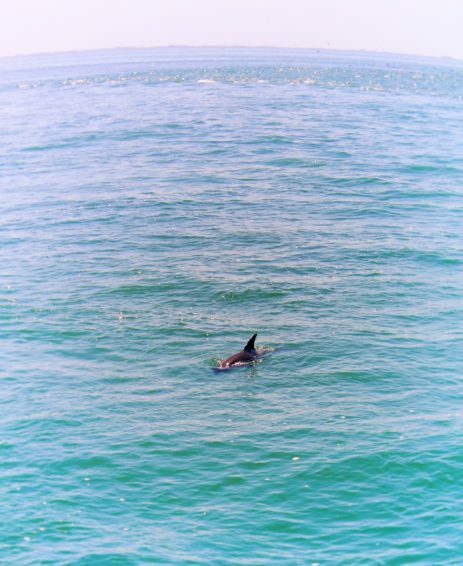 Locals love to fish off the end; dolphins love to play in the surf. When we visited there were also a few pelicans and egrets hanging out, playing in the wind. 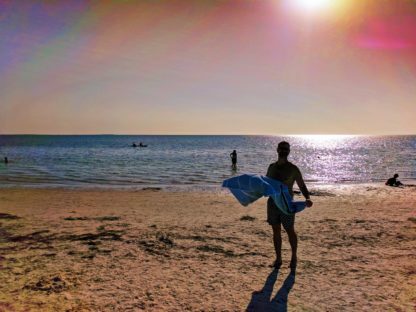 Tip: be sure you have your own beach towels when you do your Florida Gulf Coast beaches trip. 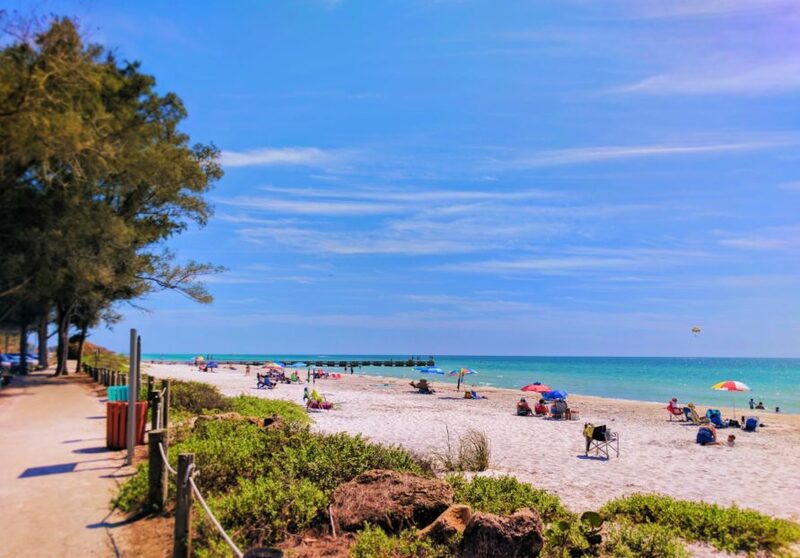 Many beaches, like Naples Beach, have showers near the beach access to clean you off before continuing on your drive to the next town. We fell in love with the neighborhood around the beach because it’s full of normal people who just happen to be blessed to live at the beach. The strip of land Fort Myers Beach is located on is a small, thin key separating Estero Bay from the Gulf of Mexico. One half of the key is bordered by mangroves and the other by the beach. It’s awesome. Fun activity: if you want to explore Estero Bay, there are kayak rentals at the north and south end of the key. 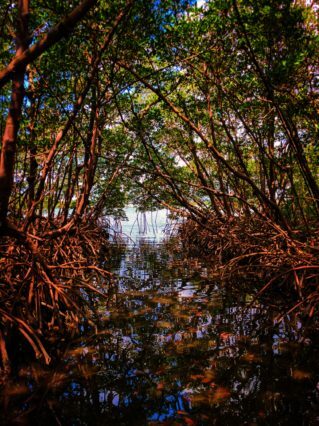 Matanzas Pass Preserve is a protected area on the Estero side that’s accessinle via kayak or on foot through a boardwalk trail system that winds through the mangroves. Watch for fiddler crabs! Beach access in Fort Myers Beach is titled by the terminating street at each point. 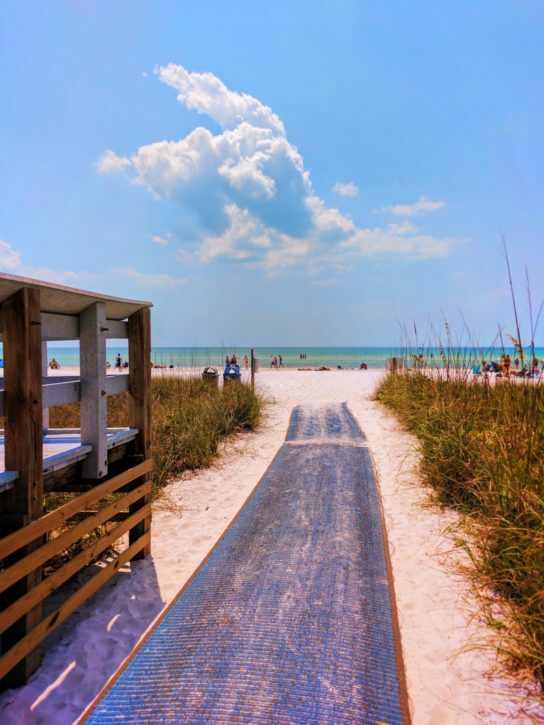 We used the Mango St access for our Fort Myers Beach day and loved it. There was a picnic platform close to our parking, making it ideal for doing beach time and lunch with kids. 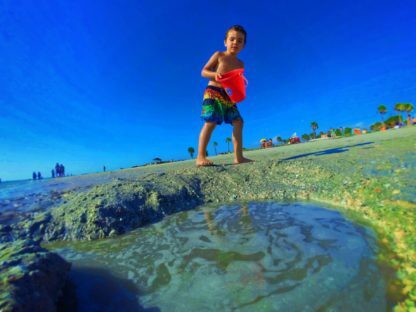 Cool beach feature: there is a rather large sand bar at Fort Myers Beach that’s teeming with life! 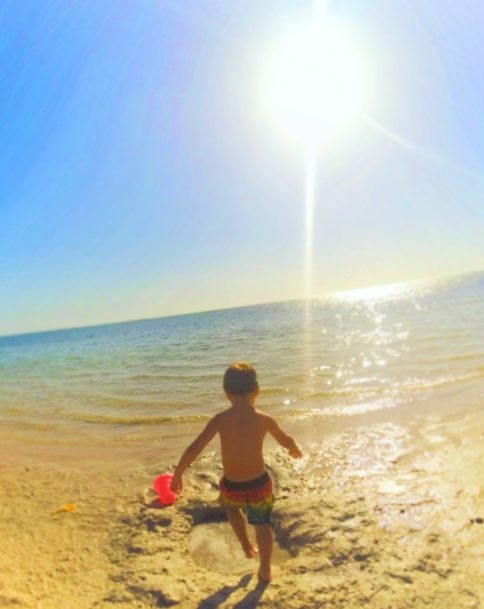 We all went out on the sand bar and it was shallow enough for us to all walk on it, looking for large snails, huge hermit crabs and super pokey sea urchins. We initially planned out our time in Venice Beach as a break in the middle of a long day’s drive. 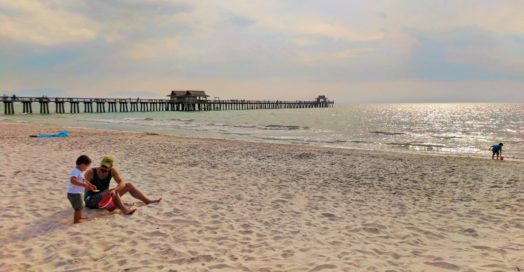 It turns out the town is a great spot for relaxing and enjoying the Gulf of Mexico. 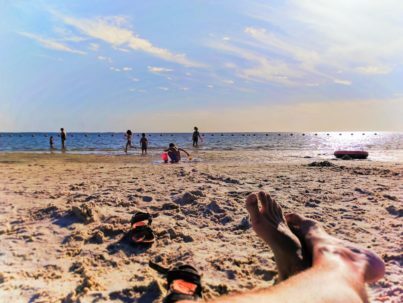 A Florida Gulf Coast beaches trip needs to have a day of just relaxing. Venice Beach is another place where beach parking is bountiful and the community is perfect for strolling. 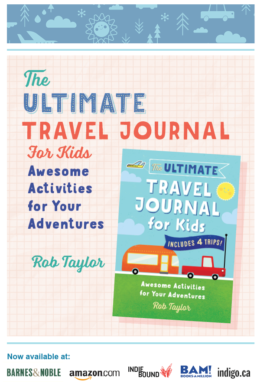 Planning a visit with kids is easy. 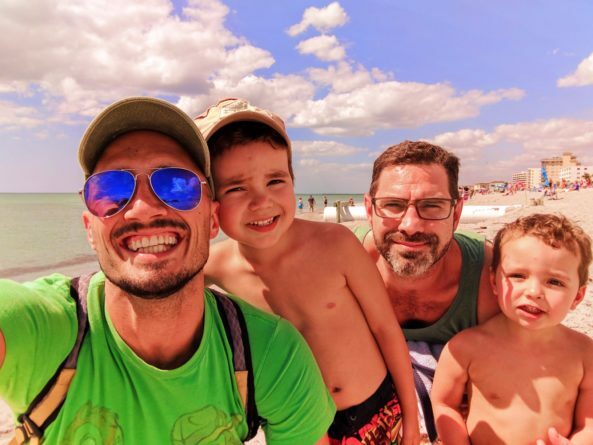 A sure fire way to have a great family trip through Venice Beach is merely grabbing lunch on the main strip, Venice Ave, and the spending a day on the sand watching the diving pelicans. Tip: Venice Beach is only 20 minutes off the main highway, so even if you’re not planning a beach road trip, you can still plan a long, solid visit to Venice Beach. Getting to Brandenton Beach is the only bummer. 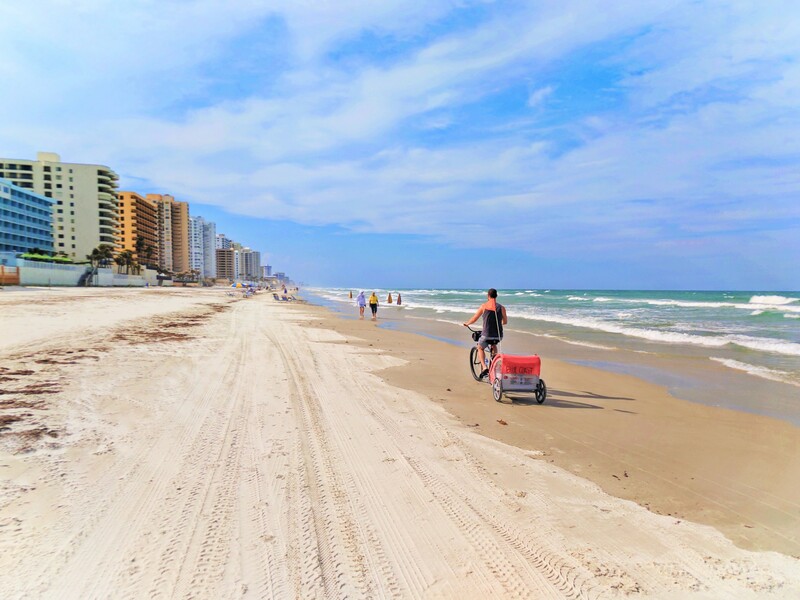 Plan your trip to this perfect beach neighborhood during the late morning. If you’re staying in the area, remember that traffic patterns follow the same ones cities do. 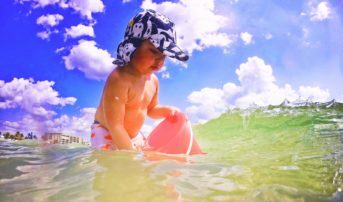 Bradenton Beach is managed by Manatee County and they keep it easy and family friendly. 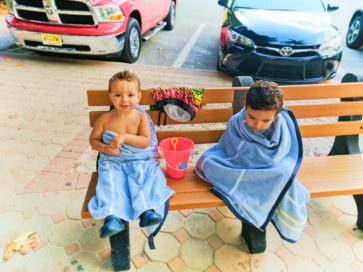 Free parking all along the beach, shower and bathroom facilities, and ample lifeguard stations make Bradenton Beach one of our favorites! We also loved the composition of the sand here, as it was layer upon layer of shells with sugar-fine sand on the top. The kids had as much fun digging as they did splashing. Tip: bring a picnic when you’re at Bradenton Beach as there aren’t many food options close to the beach access areas. I bumped into a manatee here. It’s true. I was swimming back to shore and wasn’t looking where I was going. Startled me like none other. #LoveFL. Fort De Soto is the coolest place ever. 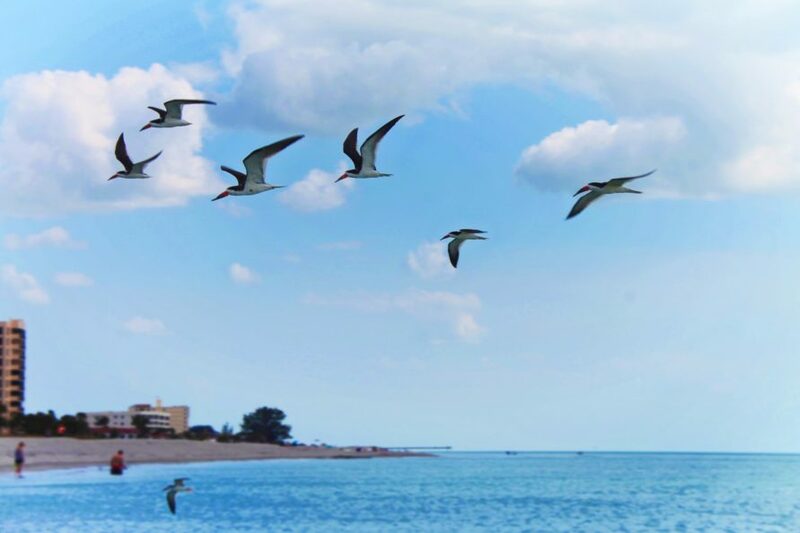 It’s in an area of St Pete Beach called Tierra Verde and the park itself is made up of five islands. 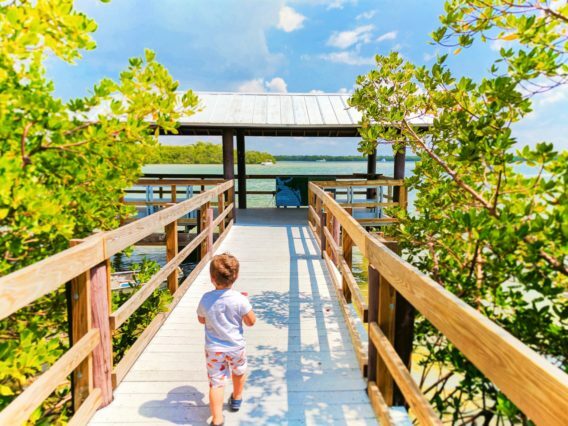 A Pinellas County Park, there is an access fee (in addition to the toll road) for getting to the Fort, the piers, and the beaches. 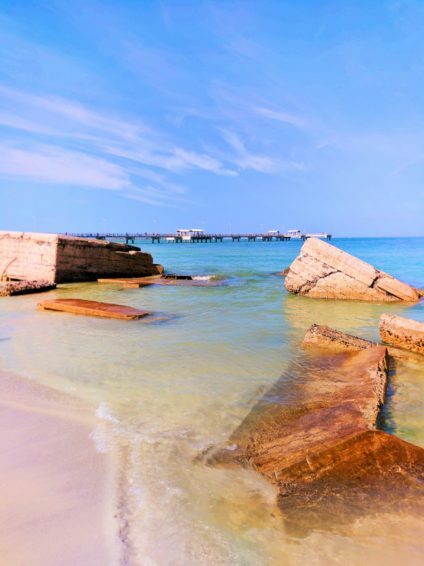 The Gulf Pier Beach, right next to the 1000-foot fishing pier, is perfect for a family beach day. There is a very large parking lot, so don’t stress it. You’ll have ample choices for where to set up your beach blanket as the sand stretches around the key and it’s all beautifully clean and perfect. You can also drive further along the key until you hit North Beach. Both are awesome! 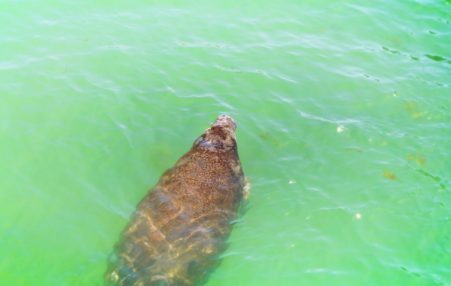 Tip: keep your eyes peeled for manatees and dolphins as they love the area. The manatees head inland past the key and the dolphins love the fish in the passage. After you’ve had beach time, visit the pier and watch the fishermen and dolphins in battle over fish; it’s fascinating. We were running back and forth on the pier watching dolphins swimming super fast and being crazy. Also at Fort De Soto Park is the foot ferry to Egmont Key and the lighthouse, an enormous bird refuge, and a WWI fort/bunker system. We were here for three days and could’ve stayed longer. On our Florida Gulf Coast road trip we stopped off in Tarpon Springs. 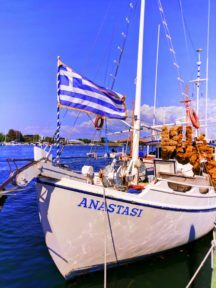 The community is a huge, traditional Greek one and it’s fun on its own. Once you’ve had your fill of gyros and baklava, no doubt you’ll be ready for some sun. Put it in your Google Maps that you want to visit Howard Park and then head out of sponge diver territory. Crossing countless canals and winding through neighborhoods, you’ll find the perfect all-purpose beach activities area. 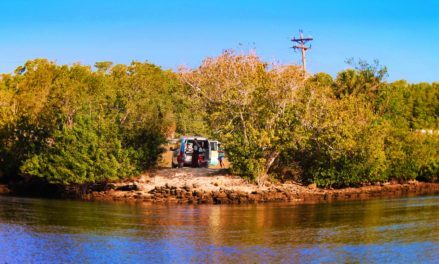 If you’re up for kayaking, windsurfing, kite boarding or even float-wheel biking ON the water, this is the place. Accessible beach surrounds nearly the whole key with only a small portion on the north end being rocky. 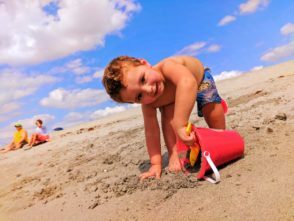 The sand here is very silty, to be prepared to use the beach showers following your splash time. 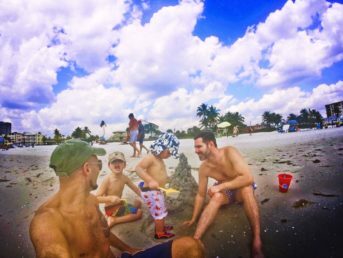 That’s just part of a Florida Gulf Coast beaches trip: play in sand, shower after. Note: parking at the beach is all pay-parking through Pinellas County. They take cash or card, so don’t forget to pay for parking lest you be ticketed or towed. Tip: if you’ve gone the campervan route, be sure that you’re sweeping out the van each day, otherwise you’ll go crazy from the sand everywhere. This is the last of the Florida Gulf Coast beaches we’re sending you to. 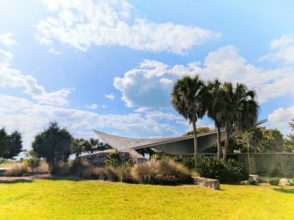 The Crystal River National Wildlife Refuge is a beautiful area where the manatee-filled Crystal River turns into a delta/estuary and meets the Gulf of Mexico. It’s another ideal place for kayaking as well as walking the trails through the grassy waterways. Fort Island Gulf Beach is just beyond the wildlife refuge. Although it’s not a very large beach, it’s a nice one. Even on a sunny Saturday afternoon it’s a quiet beach, Again, like in Tarpon Springs, the sand is very soft and silty. 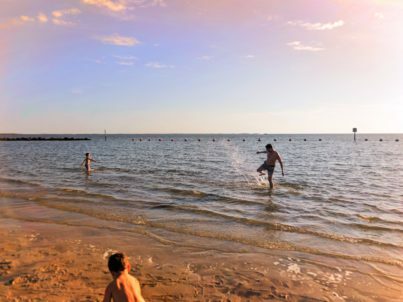 The water is extra warm in this small bay and there are plenty of crabs to keep kids entertained. And hooray for more beach showers!! Seriously, I think that’s why we love Florida Gulf Coast beaches. 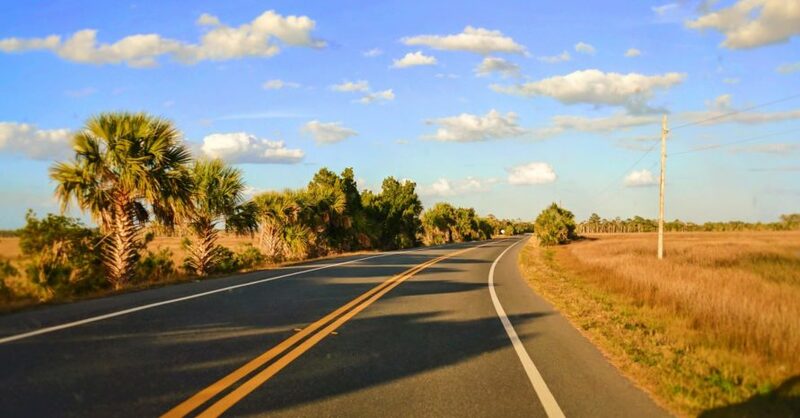 Tip: if you’re doing hotels on your road trip the Plantation on Crystal River is located on the same road as Fort Island Gulf Beach. 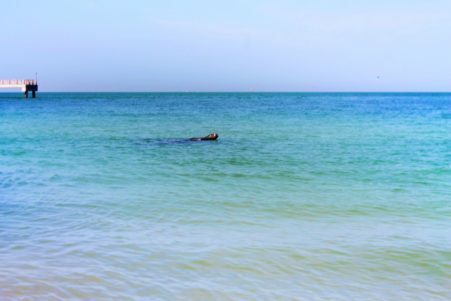 It makes for an easy manatee experience as well as excellent beach access. Note: another super cool site to visit in the area is Rainbow Springs State Park. 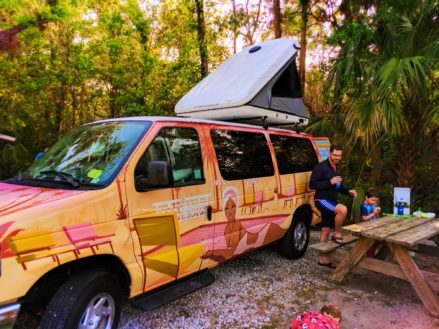 It’s not a beach, but you can swim in the most colorful, crystal clear headwaters of the Rainbow River and have a wonderful time exploring the area. 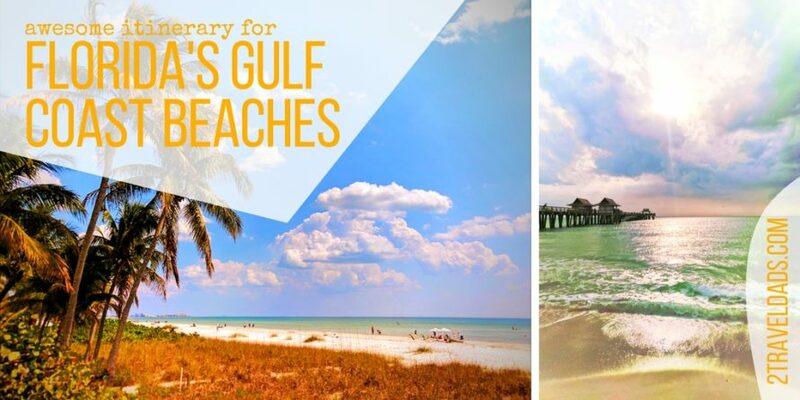 When you’ve had your fill of the beautiful Florida Gulf Coast beaches, just head to I-75 and make your way to whichever airport you’re departing from. Hopefully you’ve renewed your tan, found some really cool sea shells and made some unforgettable memories. And if you find any other beach town gems, be sure to share with us so we can hit them up next time! 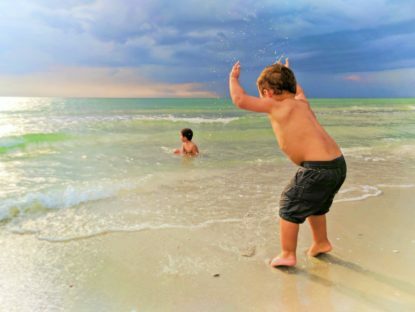 Florida Gulf Coast beaches look like paradise for kids. I bet your kids loved their time exploring all these different beaches.